Mid century Dingbat building in LA. I think Dingbat is the right name for the style, at least. Always really interesting structures. 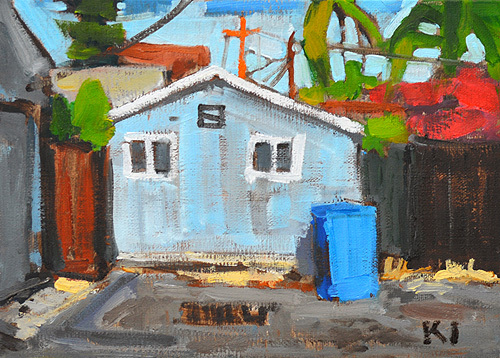 This entry was posted in Landscape Paintings, Urban Landscapes and tagged 5 x 7 inches, california, dingbat, los angeles, oil on linen on panel, street, urban landscape on September 2, 2016 by Kevin. A couple of years ago, I lived around the corner from here. I painted it. 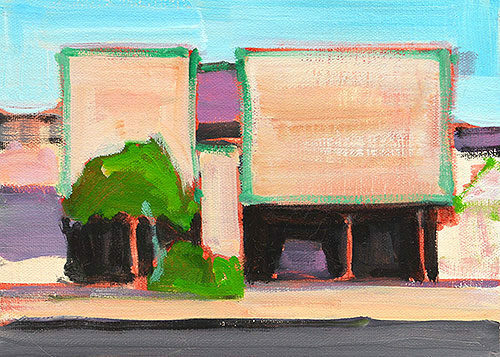 This entry was posted in Landscape Paintings, San Diego Paintings, Urban Landscapes and tagged 5 x 7 inches, california, hillcrest, oil on linen on panel, san diego, urban landscape on June 19, 2014 by Kevin. 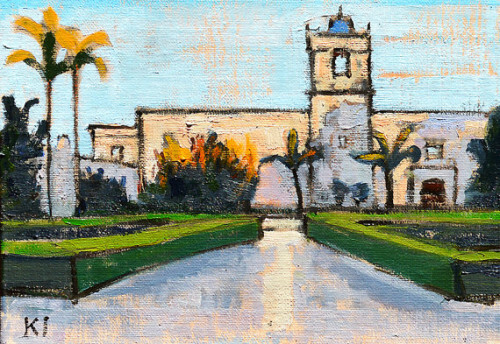 This entry was posted in Landscape Paintings, San Diego Paintings, Urban Landscapes and tagged 5 x 7 inches, alcazar garden, balboa park, california, san diego, spanish baroque, urban landscape on June 11, 2014 by Kevin. 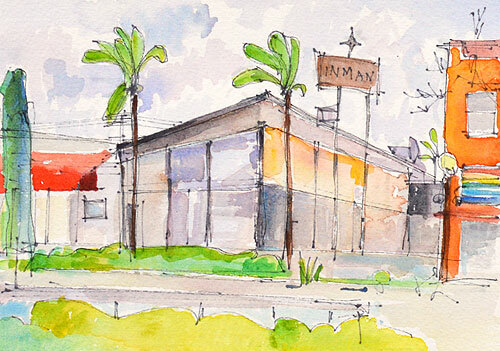 This entry was posted in Landscape Paintings, San Diego Paintings, Urban Landscapes and tagged 5 x 7 inches, california, city, coffee shop, hillcrest, mid century modern, palm tree, san diego, urban landscape, watercolor on March 1, 2014 by Kevin. 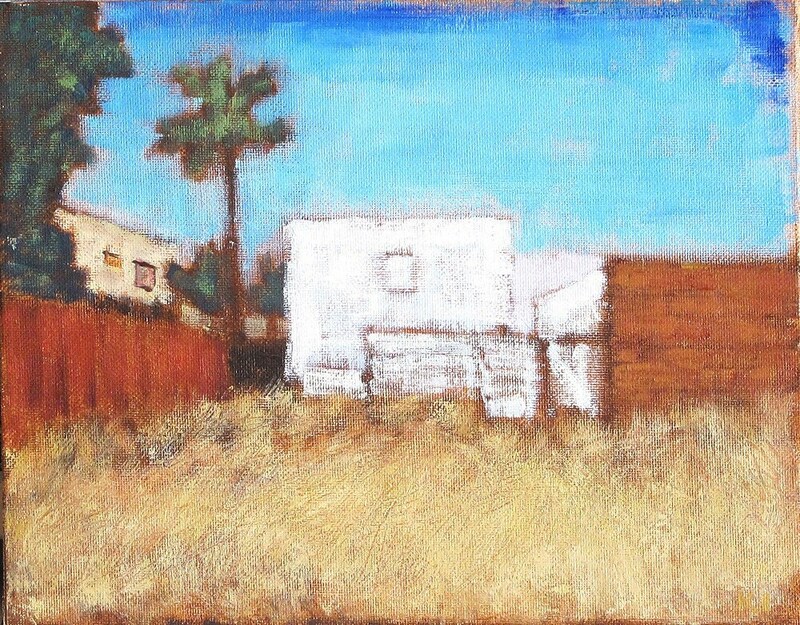 This entry was posted in Landscape Paintings, San Diego Paintings, Urban Landscapes and tagged 5 x 7 inches, california, hillcrest, mission hills, oil on linen on panel, recycling bins, san diego, trash day, urban landscape on January 13, 2014 by Kevin. 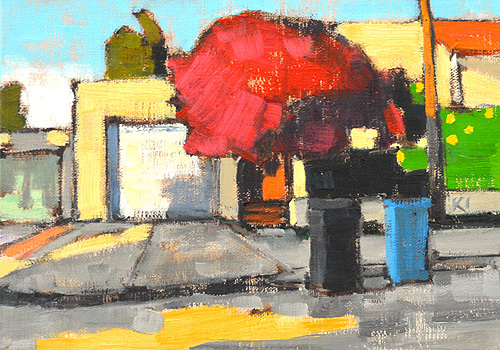 This entry was posted in Landscape Paintings, San Diego Paintings, Urban Landscapes and tagged 5 x 7 inches, alley, bougainvillea, hillcrest, north park, oil on linen on panel, palm tree, recycling bin, san diego, trash can, urban landscape on December 17, 2013 by Kevin. 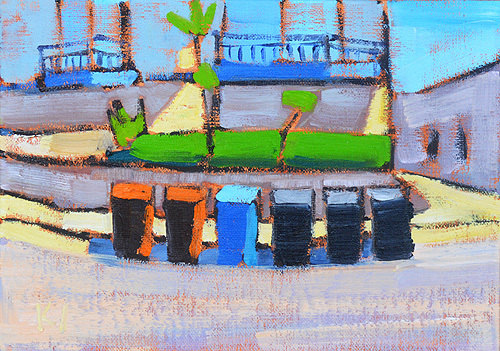 This entry was posted in Landscape Paintings, San Diego Paintings, Urban Landscapes and tagged 5 x 7 inches, oil on linen on panel, recycling bin, san clemente, san diego, trash can, urban landscape on October 9, 2013 by Kevin. I think this is the first time I’ve ever put cars in a painting. Well, maybe I did in Spain but it’s been more than a decade, so I don’t think it counts. Also, terrifying street to drive on, BTW. Let alone to park; kudos to those brave drivers. 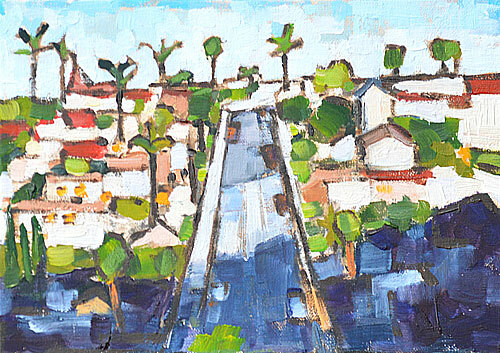 This entry was posted in Landscape Paintings, San Diego Paintings, Urban Landscapes and tagged 5 x 7 inches, california, cityscape, hill, landscape painting, mission hills, oil on linen on panel, palm trees, san diego, urban landscape on February 5, 2013 by Kevin. 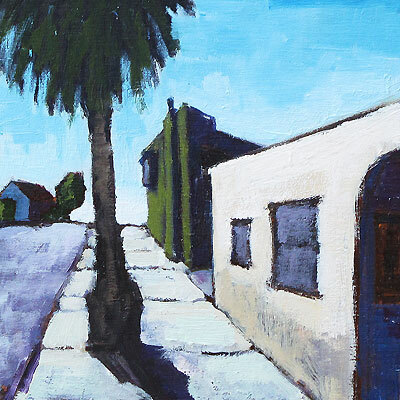 Plein Air Outside The Laundromat While My Clothes Were Drying – for sale through Randy Higbee Gallery. 6 x 6 inches, oil on wood, framed. I was very excited and honored to hear that this painting is included in the amazing 6″ Squared show at Randy Higbee Gallery. The opening Gala Artists’ Reception is Saturday, December 8th, from 5 to 9 PM. (102 Kalmus, Costa Mesa, CA Get Directions.) I’m looking forward to the opening next weekend, and if you are in Orange County, I hope to see you there! I always liked the steepness of this street, with its pile of buildings crowned with giant, shaggy date palms and a Victorian commercial building housing a yoga studio. The street is lined with a mix of architectural styles, with Victorian cottages at the bottom, 1920s Spanish Revival buildings that house holistic healing places halfway up, and an awesome 1960s Modern library on the opposite side. I wound up choosing this vantage point because it was the easiest place to park while doing laundry. Lugging the laundry up the hill was not fun, but it was the perfect place, it turned out, to paint. Also of note, there’s a great Naples-style pizza place right around the corner. 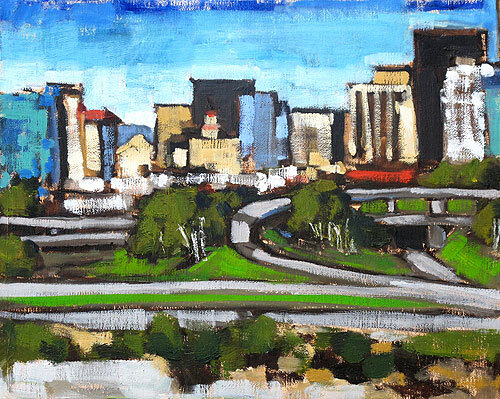 I’m also excited to announce a solo show of my urban landscape paintings at the Lyceum Gallery! The Gallery is located at the San Diego Rep Theatre lower lobby, in Horton Plaza in downtown San Diego. The show will coincide with Clybourne Park. Opening night and reception, Friday January 18; the play starts at 8 PM. More details to follow. 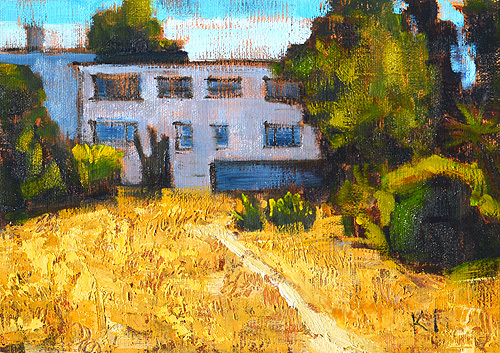 This entry was posted in Landscape Paintings, San Diego Paintings, Urban Landscapes and tagged 6 x 6 inches, architecture, oil on wood, painting, palm trees, san diego, spanish revival, university heights, urban landscape, victorian on December 2, 2012 by Kevin. 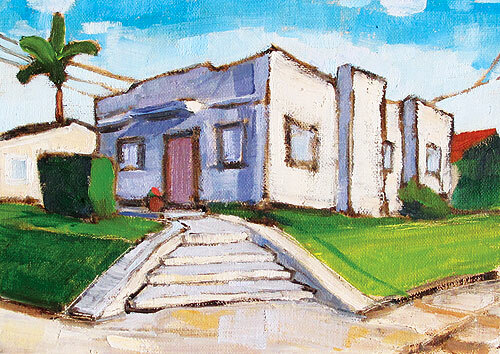 Painted from life in Golden Hill, overlooking the crisscrossing freeways and towers of downtown. 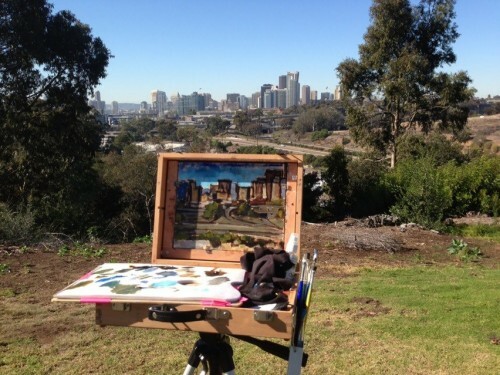 I like to get out of the studio and paint the city of San Diego and the places I travel to. This entry was posted in Landscape Paintings, San Diego Paintings, Urban Landscapes and tagged 8 x 10 inches, california, city, downtown, freeways, landscape painting, oil on linen on panel, san diego, skyline, skyscrapers, towers, urban, urban landscape on November 29, 2012 by Kevin. San Diego landscape painting of a lot near my house in Hillcrest. This entry was posted in Urban Landscapes and tagged california, san diego, urban landscape on April 20, 2012 by Kevin.